Reps. Jim Banks (R., Ind.) and Liz Cheney (R., Wyo.) introduced the "Ensuring a Secure Afghanistan Act." 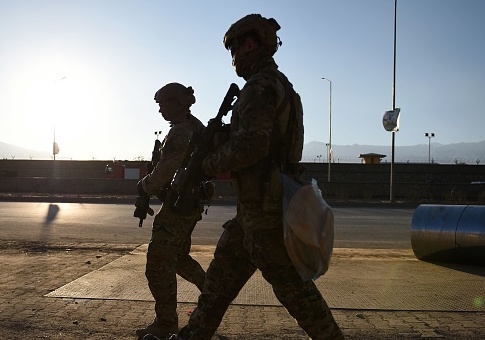 The bill would give Congress "oversight over talks between the United States and the Taliban" and ensure that an American withdrawal will only come once "certain conditions on the ground are fulfilled." The legislation follows renewed conversations about an end to one of America's longest wars. In March, Sens. Rand Paul (R., Ky.) and Tom Udall (D., N.M.) introduced legislation to withdraw all troops within the year. Currently, the U.S. maintains a balance of 14,000 troops in Afghanistan. For the last several months, the United States has been negotiating with Taliban officials (and former Guantánamo detainees) about terms of partial or complete withdrawal. The bill warns that a "premature" or "hasty withdrawal" promises "increased instability, violence, and the loss of human rights." A sudden and destabilizing withdrawal, it says, would "impact the security of the United States" and "jeopardize the tremendous gains made in development and human rights for the citizens of Afghanistan." To that end, Banks and Cheney would require any withdrawal that brings troop levels below 10,000 to meet a series of conditions. First, the Taliban, both its leaders and members, must "reject … al Qaeda by name." The Taliban must also cut all ties with the organization, and cease accepting funding and "military support" from foreign organizations. To that same end, the Taliban would need to "be an active participant" in future American-led "counterterrorism operations." Banks and Cheney sit on the House Armed Services Committee. "We don't win wars by leaving," Cheney said. Today, Afghanistan remains a "safe haven for terrorism." Currently, ISIS and al Qaeda have thousands of militants in the war-torn country. Given the circumstances, Cheney concluded, "U.S. troops must continue the fight against terrorism in Afghanistan." Banks, a Navy veteran who served in Afghanistan, warned that, "[s]hould America not get this right the first time, ISIS-K and al Qaeda patiently wait to fill the void." In a statement, he explained that a withdrawal brought about by "political pressures" would introduce a "power vacuum" comparable to "President Obama’s disastrous Iraq withdrawal." This entry was posted in National Security and tagged Afghanistan, Liz Cheney, Taliban. Bookmark the permalink.